Hand stamped & sewn leather cuff bracelet. The cuff bracelet you will never want to take off! The beauty of leather is that it gets better the more you wear it. It will become even more unique to you in finish, color and patina over time. 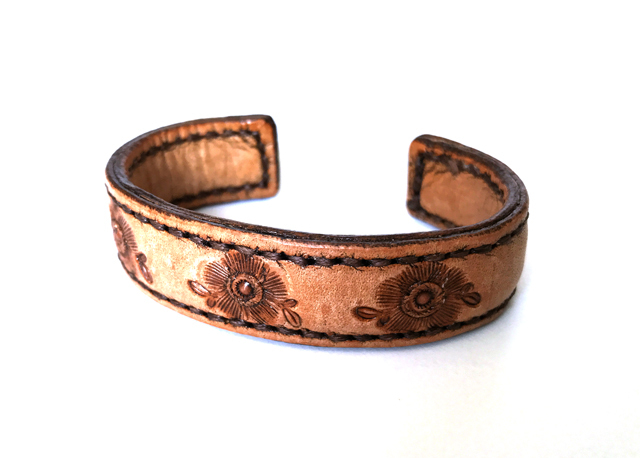 These leather cuff bracelets are hand stamped using a series of stamping tools, hand-stitched around a brass band to hold shape, then colored and finished by hand. Because of this each one differs slightly and can vary in depth of color making them all a one-of-a-kind. The leather has been treated with a finish, however if you know it is likely to get wet you may want to apply leather waterproofing as needed. Small fits a wrist size of 6″ to 7″ and is 0.75″ wide. Large fits a wrist size of 7″ to 8″ and is 0.75″ wide.